We have a highly refined and efficient process for ensuring optimal quality control throughout all of our projects. Our systematic approach is founded on more than 20 years of building experience and we specialise in “Making it easy for you…” Our time-tested five-step process produces the amazing results you see in our impressive building portfolio. Did you know that you don't need council approval to build a granny flat on your property? There are a few requirements which your property needs to meet, to be permitted to do so. ( this is compiled of land size / frontage and other items.) Follow our Complying Development table below as your starting point to the 10 day express approvals we offer. This means you are not subject to the long strenuous Council D.A Submissions ( up to 12 weeks) which you would undergo nominally. Tell us if your property Falling to the street or the rear of the property (i.e is the area you want to build higher or lower than the street). Are there any large tress in the vicinity where you want to build (ie: Trees 6m or larger in your property or your Neighbour's property?). Prior to Coming out to View Your property, we ask for your Section 149 and Sewer Diagram, and also review your property on Google maps, to assess wether your property has all the minimum requirements as we outlined in the first step. A Representative of Granny Flat Builders Sydney will then book a suitable time and day to come and inspect your property. We will then follow through with a preliminary tender to build one of our standard or custom designed Granny Flats to suite your budget. In this tender you have the entire cost of the Granny flat, as well as connections to services along with any extra Inclusions you may want. We will also advise you of any potential extra costs that may arise should your property have special circumstances. During this Period we finalise our Tender quote that works within your budget. Once you decide to move forward the Design / Approval Fee is Payable in two part payments, to get the ball Rolling for your Granny Flat. The Design fee covers all relevant Survey, Architectural and Engineering Plans in order to lodge to Certifier. During this stage you will be given the opportunity to conduct changes, in order to gain a suitable solution for your own circumstances. We will take the time to understand your needs and custom design something for especially you, or you may choose something from our fantastic standard design range. Once design is finalised the materials and colours are selected from our nominated builders range and detailed costing will be provided. 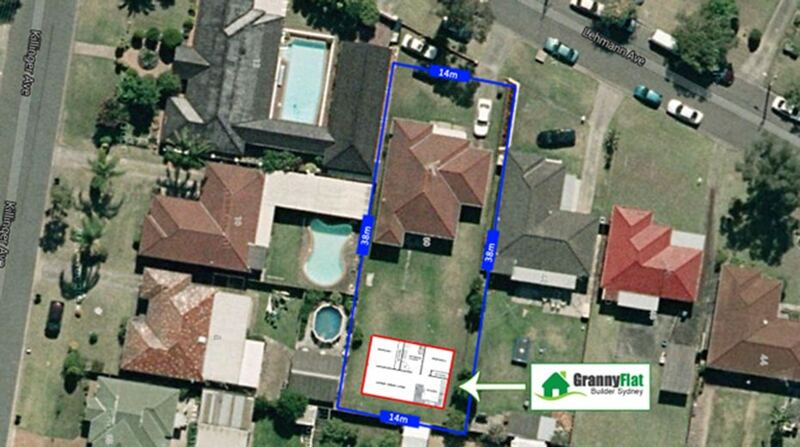 We will prepare and lodge all the necessary applications and documents for your granny flat. The building contract then prepared and signed. We will also apply for home warranty insurance. Our staff then plan internally to commence work on your project. Construction duration may vary from between 10 -12 weeks we will provide you with a construction schedule to suite your project objectives. We will then build your new home in your backyard with minimal disturbance to you, and all the relevant approved documentation and clients selected colours and materials. Internal door jambs and fixout. The above mentioned time frame is typical and may vary from project to project depending on certain variables. Construction time frames are subject to material availability, unexpected delays and other site conditions that may or may not exist.